This bride and groom had a waterfront theme wedding from start to finish. Their wedding reception was held at the amazing Allegria Hotel on the boardwalk and ocean in Long Beach, New York. Claiming to offer a "...Taste of The Hamptons close to New York City..." NYC, The Allegria is an absolutely awesome venue at which to host your wedding. At the beginning of the day the bride and her bridesmaids got ready at a luxurious waterfront home on the south shore of Nassau County, NY. This photograph was taken there. 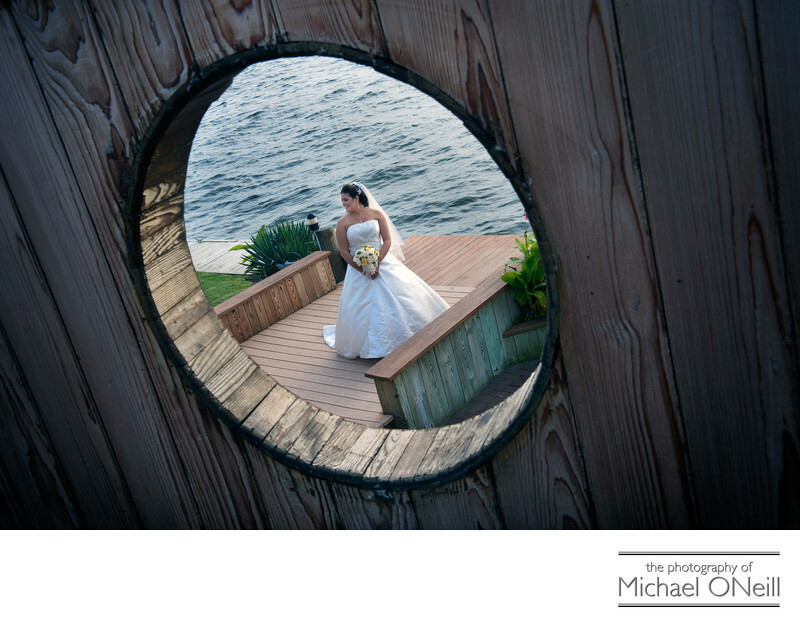 There was a magnificent multi-level deck facing the water and I climbed to the upper level to shoot through this decorative circular "window" at the bride standing on the lower level deck below. Long Island is all about waterfront weddings and this couple rocked that theme!